George Thomas Delacorte, Jr., was born George Ferdinand Tonkonogy, Jr., on June 20, 1893 in Brooklyn, New York. His father, also named George F. Tonkonogy, was born in 1867 in Hungary of Jewish ancestry, and emigrated to the U.S. in 1888. His mother, Sadie Adolphina Koenig, was born in 1873 in Russia of Jewish ancestry, and emigrated to the U.S. in 1886. His parents married in 1890 in New York City and lived at 137 Osborn Street in Brooklyn. They had four children, Abraham (b. 1891), George (b.1893), Mary (b. 1895), and Henrietta (b.1898). The father was a lawyer with a private Law Office at 1765 Pitkin Avenue in Brooklyn. The Tonkonogy family was prosperous enough to have a servant and to travel to Hungary to visit the paternal family in 1904. That same year his parents divorced. Again in that same year his mother, Sadie Adolphina Koenig, married her second husband, Adolph Benevy, who was born in 1877 in Russia of Jewish ancestry, and came to the U.S. in 1890, where he became a Lawyer. He also had a practice in Brooklyn, so it seems likely that both lawyers had a business acquaintance. Mr. & Mrs. Benevy had two children, Isabelle (b.1906) and Herbert (b.1908). The Benevy family lived at 1834 Bergen Street in Brooklyn. In 1906 the Benevy Law Office was located at 42 Graham Avenue in Brooklyn. Adolph Benevy also owned and operated the Lincoln School in Brooklyn, which was a finishing school for boys. In addition to these interests Adolph Benevy was also a popular public orator concerned with the promotion of Bolshevik and Socialist ideology. According to Mrs. Benevy he was a "Free Thinker." On June 26, 1906 at the age of thirteen George Tonkonogy, Jr., graduated P.S. 84 at Glenmore and Stone Avenues in Brooklyn. His graduating class consisted of thirty-seven boys. The commencement ceremonies included a reading by George Tonkonogy, Jr., of selections from Julius Caesar by William Shakespeare. After graduation he attended Brooklyn Boys' High School, located at the intersection of Marcie and Putnam Avenues. In 1907 his father, George Tonkonogy, married a second wife, Sylvia Zuckerman. She was born in 1881 in Russia of Jewish ancestry, emigrated to the U.S. in 1893, and was raised in Philadelphia, PA. They proceeded to have four more children, Eugene (b.1907), Gertrude (b.1908), Isidore (b.1910), and Andrew (b.1911). In June of 1910 George Tonkonogy, Jr., graduated from Brooklyn Boy's High School. He was seventeen years old. In September of 1910 he began to attend Harvard University as a member of the Freshman Class. He completed his first year in June of 1911 and then returned to NYC. In September of 1911 he began to attend Columbia College. He studied the Business of Advertising. While a student at Columbia George Tonkonogy, Jr., fell in love with another college student, Margarita Von Doenhoff. She attended Barnard, the Girl's College affiliated with Columbia, which at the time was a Boy's College. Margarita Von Doenhoff was born February 17, 1891 in St. Augustine, Florida. Her father, Dr. Edward Von Doenhoff, was born in 1850 in Hungary. Her mother was a celebrated Opera Singer, Helen Von Doenhoff, who was born Evelyn "Eva" Pieczonka in 1861 in Hungary. Margarita's brother, Albert Von Doenhoff (b.1880), was a celebrated Concert Pianist. Her younger sister, Dorothea Von Doenhoff (b.1894), was also a student of Barnard College, where she also studied Language. 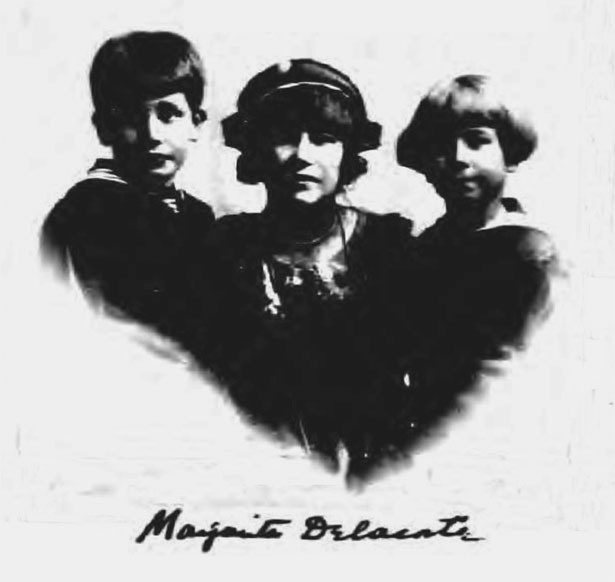 Margarita had graduated from Hunter College in 1912 and was then attending Barnard College to become a certified German Language High School Teacher. On August 30, 1912 George Tonkonogy, Jr., married Margarita Von Doenhoff in Mount Holly, New Jersey. They moved to 413 Washington Avenue in Spring Lake, NJ, which is on the Jersey Shore near Asbury Park. In 1913 George Tonkonogy, Jr., is listed in the Harvard Alumni Directory as a former student, who currently resided at 456 Fourth Avenue in Manhattan, NYC. By 1913 Adolph Benevy had abandoned his wife and two children. Sadie Adolphina Koenig Benevy sued him for alimony and child support. During the trial he defended his actions by claiming they had never legally married. The judge took her side and ordered him to pay $25 a week in alimony as well as $100 to cover his wife's legal fees. 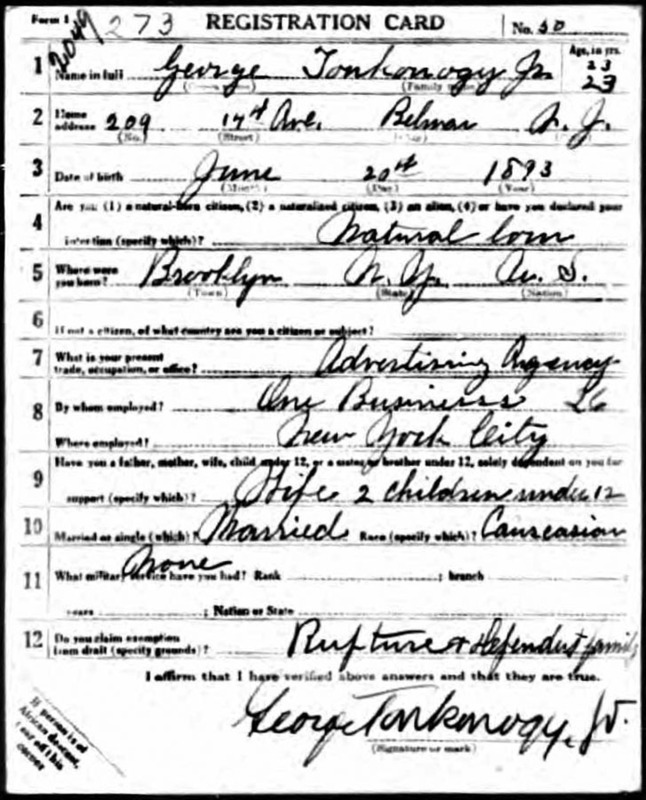 On October 30, 1913 Margarita and George Tonkonogy, Jr., had a son, Albert Tonkonogy. He was named after Margarita's brother, Albert Von Doenhoff, the celebrated pianist. In December of 1913 George Tonkonogy, Jr., graduated with a B.A. Degree from Columbia College, where he studied the Business of Advertising. In 1914 Margarita Tonkonogy became certified to teach German in NYC High Schools. She was assigned to Brooklyn Boy's High School, which was her husband's alma mater. The 1916 NYC Business Directory listed George Tonkonogy of Belmar, NJ, as the President of North Eastern Display Company, Inc. The Treasurer of the company was listed as Margaret Von Doenhoff Tonkonogy, of Belmar, NJ. The Secretary was listed as Mae Tonkonogy of Brooklyn. She was George's younger sister. On June 5, 1917 George Tonkonogy, Jr., reported for draft registration during the Great War. His residence was listed as 209 14th Avenue in Belmar, NJ. He was recorded at the time to be twenty-three, of medium height and medium build with brown eyes and dark brown hair. His occupation was listed as Owner of Advertising Business. He requested an exemption from military service on the ground of a physically disabling "rupture," as well as the financial dependence of a wife and two infant children. He was not selected for military service. On November 28, 1917 his son George Ferdinand Tonkonogy, III was born in NYC. On September 1, 1918 his Mother-in-Law, Helen Von Doenhoff, died in NYC at the age of fifty-seven. 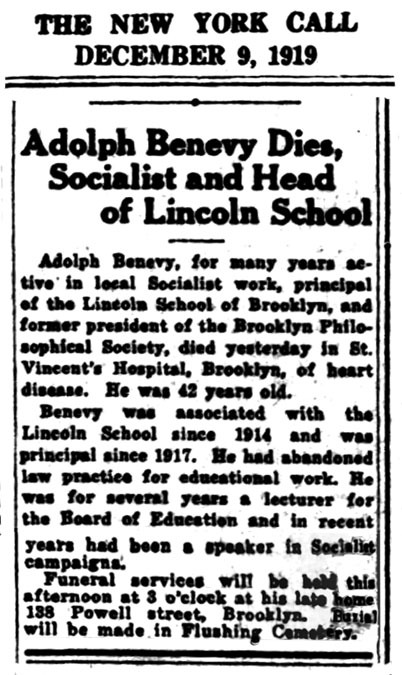 On December 8, 1919 his mother's second husband, Adolph Benevy, died of heart disease in Brooklyn at the age of Forty-two. The Socialist newspaper The Call published his obituary. On January 28, 1920 the U.S. Census listed the family of "George Delacorte, Jr." lived at 22 East 89th Street. Before that time no person had ever been listed under the name "Delacorte" as a resident of New York City, so in some ways the name "Delacorte" was a unique invention. 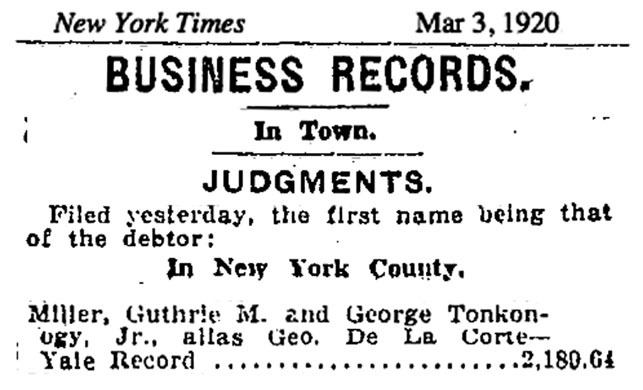 On March 3, 1920 The New York Times published a legal Business Record that listed, "George Tonkonogy, Jr., alias George De La Corte," as a debtor of $2,180.64 owed to The Yale Record. The publisher always credited his wife with the invention of the name "Dell." 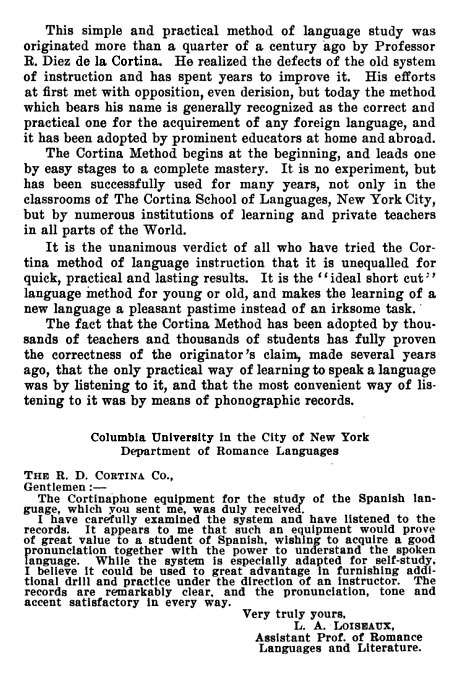 In light of the fact that until this time his family name was Tonkonogy a fascinating origin of the name is suggested by his wife's professional awareness of an outstanding leader in field of Language Instruction, Rafael De La Cortina (b.1857). Margarita and her sister, Dorothea, as well as her son, George III, all studied Language Instruction in college and all became certified high school language teachers. 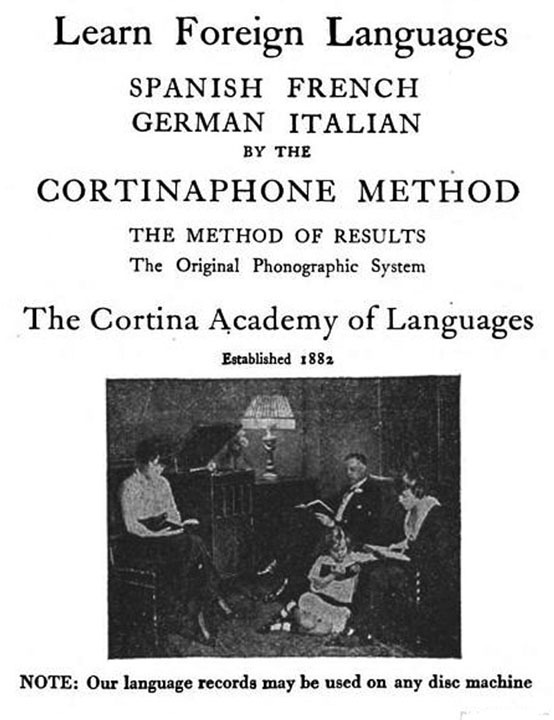 At that time a popular method to teach foreign language was offered by the Cortina Academy of Languages, of which the founder, president and publisher was Rafael De La Cortina. He promoted the Cortina-Phone Method, which used phonograph recordings to improve spoken accents. The Cortina method was taught at Columbia University. So it would be impossible for Margaret Tonkonogy to have not known the name "De La Cortina." 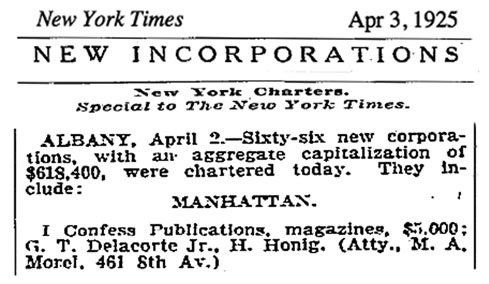 It is also worth noting that The New York Times first published her husband's new "alias" as three separate words, "De La Corte," in the same manner as the famous linguist, "De La Cortina." The 1920 NYC Business Directory listed George T. Delacorte as President of Snappy Stories Sales Co,. His home residence was in Monmouth Beach, NJ, but he also had an apartment in NYC at 22 East 89th Street. 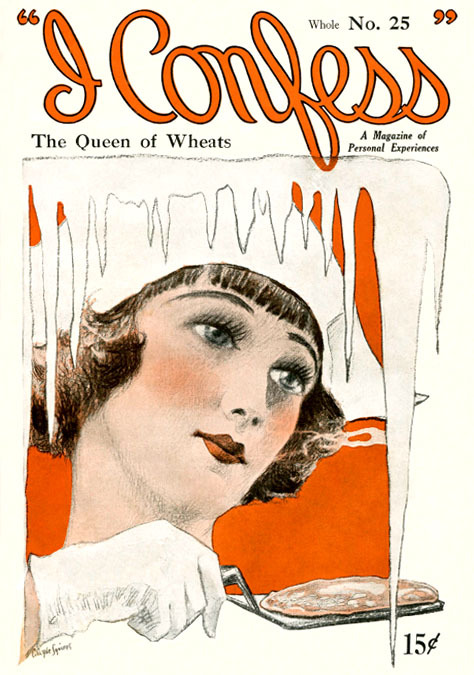 As President of Snappy Stories Distribution Company, Inc., George Delacorte, Jr., was in business with William Mann Clayton (b.1884), the publisher of Snappy Stories, which followed the format of the popular literary magazine, Smart Set. Oddly enough, Smart Set was founded by William Mann Clayton's father, Colonel William Mann (b.1839). When the Colonel died in 1920 the publishing business was restructured during the settlement of his complex estate. One consequence of this process was the founding of the Publisher's Fiscal Corporation, Inc., of which the President was W. M. Clayton. Another important result was the appointment of George Delacorte, Jr., as Business Manager of Snappy Stories Magazine. After only a few months he was dismissed and received a payment of $10,000, with which he founded Dell Publishing Company, located at 46 West 24th Street. 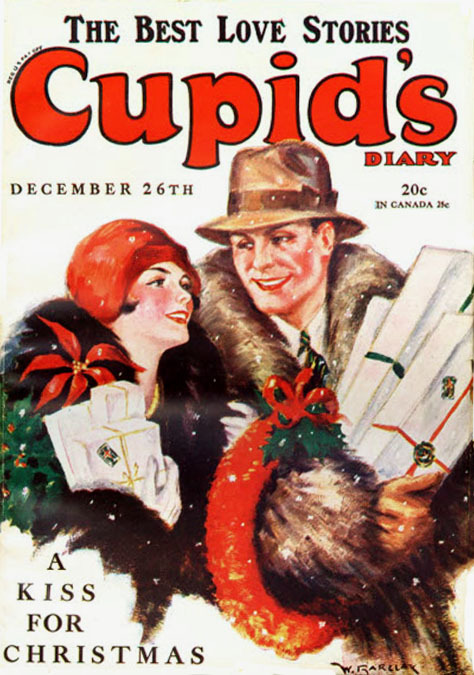 His first periodical was I Confess, a romance magazine that followed a candid testimonial format that had been popularized in 1919 by Bernarr Macfadden with True Story Magazine, which was also influenced by the success of Town Topics, a scandal sheet also founded by Clayton's father, Colonel Mann. In 1922 George T. Delacorte, Jr., was listed as living at 431 Riverside Drive. This is a large apartment house, known as Columbia Court, which faces the Hudson River on the Upper West Side, two blocks from Columbia University. Oddly enough, the celebrated Linguist, Rafael De La Cortina, and his wife, Marguerite De La Cortina, had also lived in this same building since at least 1918. In 1924 George Delacorte, Jr., applied for a passport to travel with his family to Europe. He was recorded to be thirty-years-old, five-eight, with brown eyes and dark brown hair. 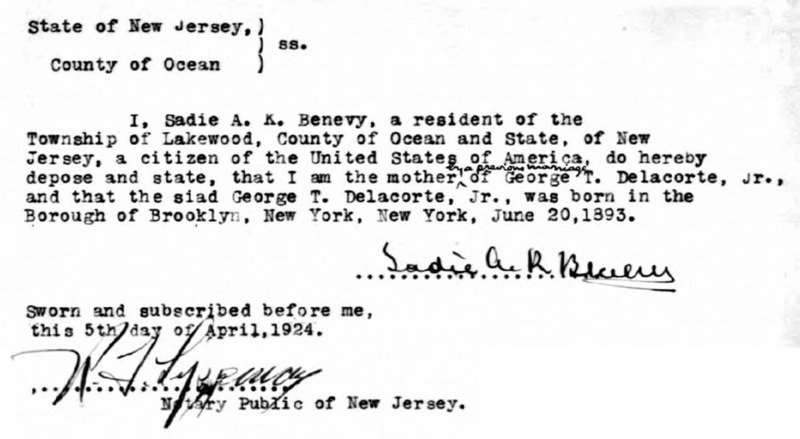 Since he had changed his family name, he was not able to provide a birth certificate, so he asked his mother, Sadie Adolphina Koenig Benevy, who lived in Lakewood, NJ, at that time, to support his claim by providing a notarized affidavit that she was his mother "by a previous marriage." 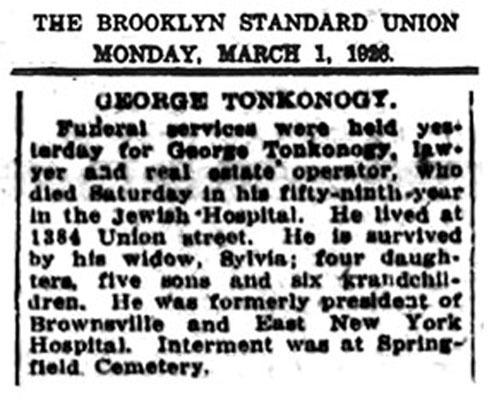 On February 27, 1926 his father George Tonkonogy died at the age of fifty-nine in Brooklyn. In 1927 his son Malcolm Delcorte was born. In 1928 his daughter Consuelo Delacorte was born. In 1930 his daughter Irene Marianne Delacorte was born. 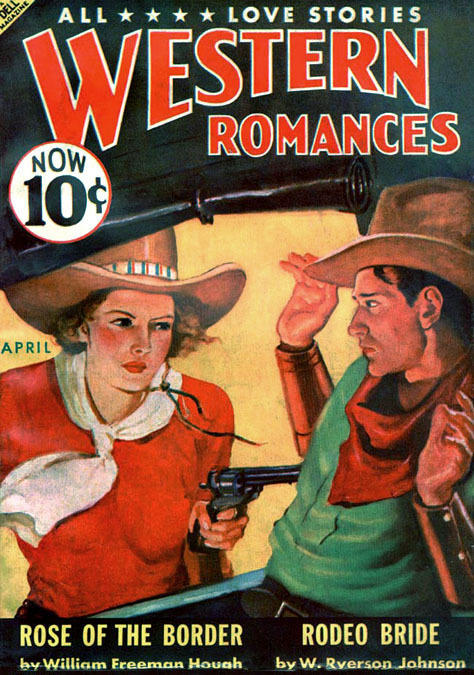 Dell Publishing produced pulp magazines, such as Cupid's Diary, All Detective, All Western, Public Enemy, Five-Novels Monthly, and Western Romances. 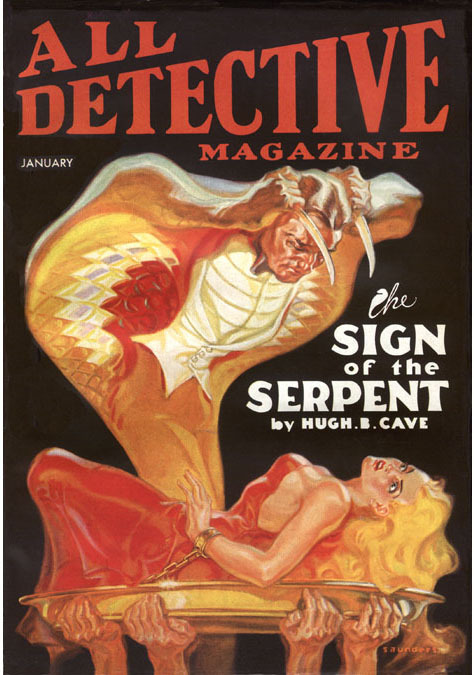 Artists who illustrated Dell pulp magazines included Norman Saunders, George Rozen, John Drew, Gerard Delano, and Stockton Mulford. One of Dell's most popular innovations were activity magazines, such as Scrap Book, Movie Mix-Up, and Crossword Puzzle Magazine, which started a new popular genre in the publishing industry. 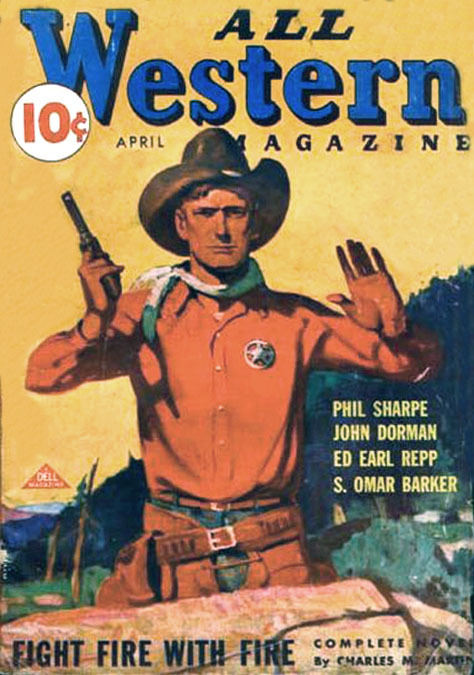 In 1931 his most popular magazine was Ballyhoo. 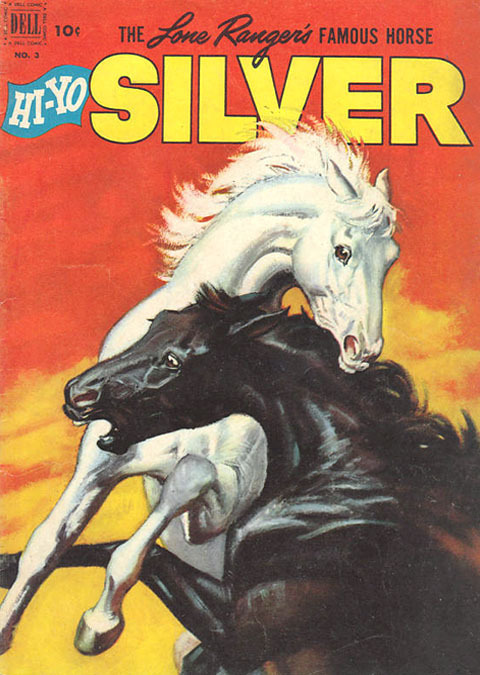 The first issues came with the slogan "Read a Fresh Magazine" and were wrapped in "cellophane," which at that time was a novel new hygenic material. By the fourth issue Ballyhoo had sales of two million copies. This phenomenon sent shock waves throughout the publishing industry. In 1931 his daughter Victoria Delacorte was born and then in 1932 his daughter Margarita Delacorte was born. On May 5, 1933 his mother, Sadie Adolphina Koenig Benevy, died at the age of sixty. 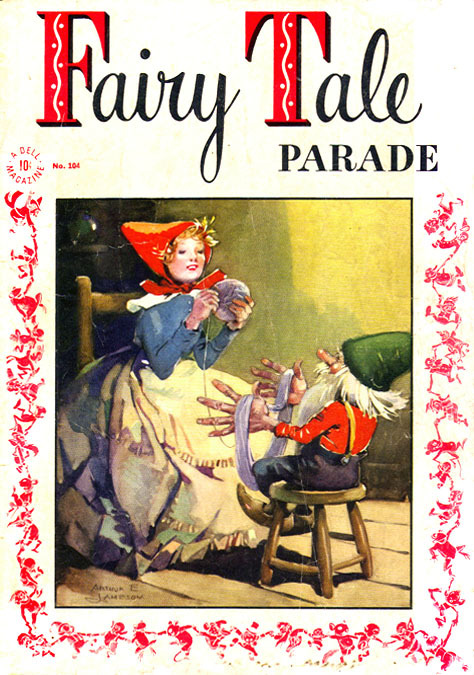 In 1935 Dell published humor magazines, such as Film Fun, Comedy, and 1,000 Jokes, which were edited by William Grady with Assistant Editor Boni Victor Bloom (b.1908). 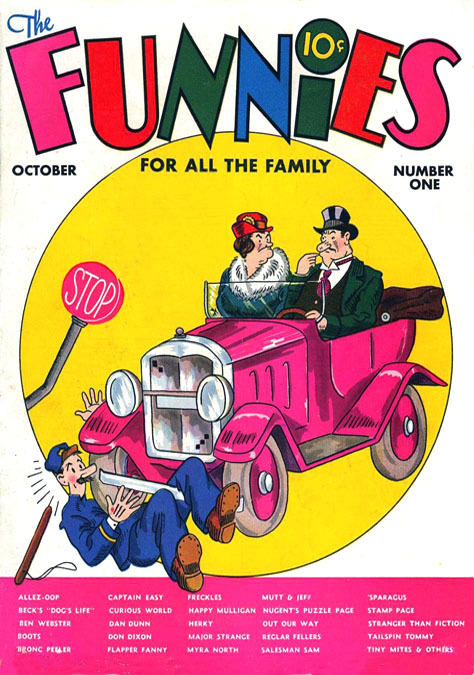 By 1937 Dell published comic books, such as The Comics, and The Funnies. In 1938 Dell joined with Whitman-Western Publishing Company of Racine, Wisconsin, to produce Dell Comics, which featured animated cartoon characters, such as Mickey Mouse, Donald Duck, and Bugs Bunny, and proved successful. Monthly Sales were reported to reach three million copies. 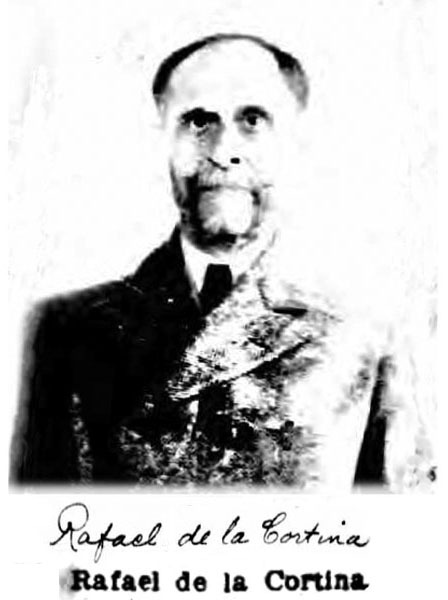 On October 3, 1940 his Brother-in-Law, Albert Von Doenhoff died in NYC at the age of sixty. In 1940 George Delacorte lived at 927 Fifth Avenue, with his wife and six children. 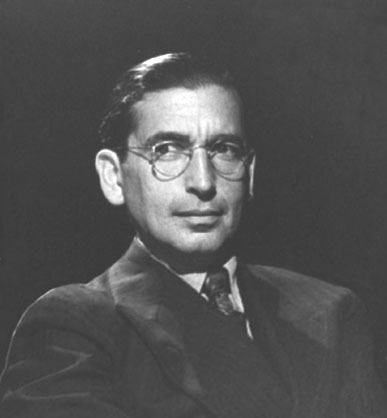 His eldest son, Albert Delacorte, was employed as an editor at Dell Publishing Co.
On April 27, 1942 George Delacorte, Jr., reported for draft registration during WWII. He was recorded at the time to be forty-nine, five-eight, 163 pounds with brown eyes and hair with a ruddy complexion. He did not serve in the military. 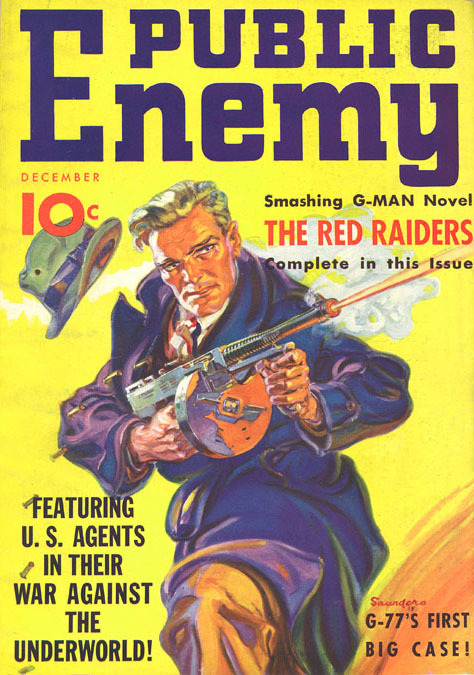 After WWII the readers of pulp magazines began to decline, but Post-War comic books sold well. By 1949 the industry was shaken by political controversy that introduced self-censorship, but Dell produced wholesome comics, so their sales remained high even during this crisis. 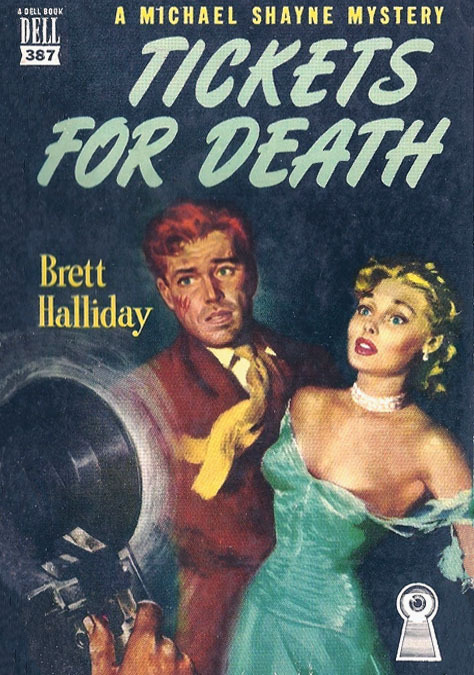 Dell also followed the trend to prodcue paperback books, which were popular in the Post-War period. During the 1950s the family lived at 998 Fifth Avenue, near 81st Street, across from the magnificent entrance to the Metropolitan Museum of Art. They also had a summer home in Greenwich, Connecticut. On August 18, 1956 his wife Margaret Delacorte died at the age of sixty-five in Greenwich, CT. In 1960 he married his second wife, Valerie Hidveghy. She was born in 1919 in Hungary. She was a retired actress and the widow of Gabriel Pascal (1894-1954), a theater director and associate of George Bernard Shaw (1856-1950). In 1971 George T. Delacorte, Jr., sold Dell Publishing to Doubleday and retired from publishing. He became a generous donor to Columbia University, where he established the Delacorte Professorships in the Humanities and Magazine Journalism. He also funded the George T. Delacorte Center for Magazine Journalism. His philanthropic gifts have elevated public life for every citizen in New York City, by funding several public fountains, a musical clock, statues of fictional characters from classic literature as well as the Delacorte Shakespeare Theater in Central Park. George T. Delacorte, Jr. died in NYC at the age of ninety-seven on May 4, 1991.